As we reported Tuesday, two knife-wielding ISIS terrorists attacked a Catholic church in France, killing a priest by slitting his throat and gravely wounding a nun said to be fighting for her life. 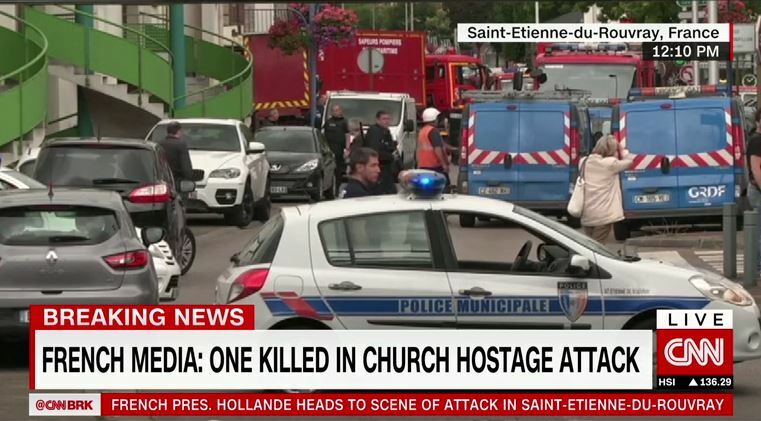 But, CNN said Tuesday, the real target wasn’t the Christian church, but Muslims. Although attendance numbers are down, Catholicism is still deeply entwined in the national fabric of France, and the attack has already led to outrage across the country. The goal in going after such a provocative target? To trigger a backlash against Muslims in France and drive the country’s Muslims into the recruiting arms of the Islamic State. The attackers filmed the atrocity, a nun who managed to escape told CNN affiliate BFM. In urging attacks on churches, ISIS is trying to eliminate what it calls the “grey zone” for Muslims in the West by provoking a far-right backlash. A drumbeat of attacks in France has led to a groundswell of anti-Muslim anger, which is being stoked and exploited by far-right politicians. According to France’s National Human Rights Commission (CNCDH) there were 429 anti-Muslim threats and attacks in 2015 — a rise of 223% from the previous year. Marine Le Pen, the leader of France’s far-right national front, reacted to Tuesday’s atrocity by renewing calls for fundamentalist mosques in France to be shut. ISIS, he noted, has declared war on Christianity and, he said, ISIS and its supporters are trying to usher in what he called “a new war of religions.” That’s why they’re going after churches. By attacking Christians, these jihadists want to start such a backlash against Muslims that they’ll want to run off to join ISIS. Of course, if leaders hadn’t allowed the flood of migrants in the first place, these attacks would probably not have happened. Worse yet, we have politicians in the U.S. who, like Hillary Clinton, believe Muslims have nothing to do with Islamic terrorism and seek to appease those who wish to kill us all. One has to wonder — is there something more behind all this?